In flight the Black Scoter's primary feathers can look pale. The Yellow bills on these birds are very distinctive. Beware the Common Scoter can also have pale primary feathers and has a yellow bill although not as bright and prominent as the Black. The Male Black Scoter is an all black bird with no wing bars. It's bill has a distinctive bright yellow bulge on the top that if seen closely has an orange base. It's primary feathers in flight can look pale. The Black Scoter often feeds closer to shore than other Scoters and frequently enters the surf area. The Black Scoter is a marine species going ashore on remote tundra to breed. 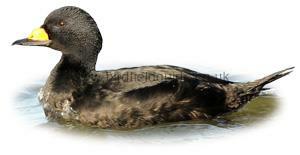 The Black Scoter breeds in Eastern Siberia and North America. A rare vagrant to the UK and Europe. The Female Black Scoter is an all dark brown bird with no white markings, pale cheeks and occasionally a small amount of yellow on the bill. 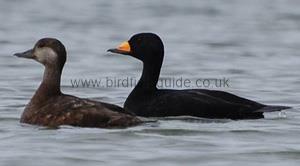 Male Black Scoter with one female. 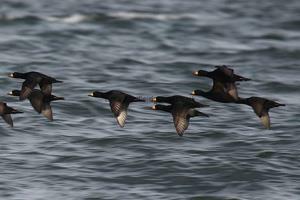 When seen closely the Male Black Scoter is distinctive due to the yellow bill and lack of any white markings. Note the orange area of the yellow bill which can sometimes look brighter. 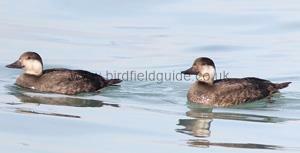 The Female bird in this image is not so distinctive and can be very hard to separate from other Scoters when seen alone and out of her usual range. The Female Black Scoter is virtually indistinguishable from a Female Common Scoter and doing so in the field is questionable. It is slightly bigger than the Common, it's neck thicker, the brown on the nape is square at the base when seen from the back where as the Common's is pointed. The bill is slightly more swollen at the base.